The characters are still unrestrained—fighting for their place on the stage at full pitch. And there is no subtlety or fine-tuning in Shaw’s mandate for a cooperative world. It is all there … overblown and caricatured—funny, farcical, yet very real. The concept of a league of nations is underscored by the set design of Camellia Koo. A palate of peacock blue and fluffy white blotches covers the backdrop and the floor in each scene, creating the sense that the world really is universal—the sky and clouds surround all of us—and there are no boundaries between countries. The play displays the impossibility of nation states working together. A mock trial is held for Hitler (Ric Reid), Mussolini (Neil Barclay) and Franco (Lorne Kennedy) in the International Criminal Court in The Hague. A British foreign secretary (Patrick Galligan), an American (Diana Donelly), a German Jew (Charlie Gallant), a Canadian (Andrew Bunker) and a Russian (Moya O’Connell) air their grievances against the three dictators. It’s high drama—unfortunately in need of editing. Murrell’s adding of Canadian character— Darcy Middleman—adds a few laughs (Canadians study everyone’s history but their own), but does not essentially alter the direction of the text. This is undeniably Shaw at his best—and worst. The conflicts are obvious even at the superficial level—in the impressive costumes of Victoria Wallace. The drab clothes of the Bolshevik—O’Connell’s Commissar Elizaveta Poskaya—contrast the boisterous red and black embroidery of the uniform of Barclay’s Il Duce. The characters in the International Court in The Hague hate each other and spit out their venom in satirical quips and short pontifical monologues. Would the situation be the same today? All of the problems the playwright presented are still with us and the international court does not seem to be any more effective than it was eighty years ago, when Shaw penned the play. As Kennedy’s El Generalissimo prances about imitating Franco, and mocking Communists, he sounds like a voice on the radio. Shaw clearly had a crystal ball on world events. Kennedy always shines in comedy and this is no exception. He and Barclay light up the stage with their fanatical fury. The play is worth seeing, if not for the fascinating ideological debates, then for the outstanding renditions of the three despondent dictators. The play is funny, witty and important. 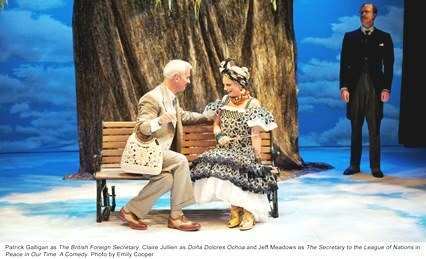 Peace in Our Time is on at the Court House Theatre until October 12th.